This afternoon the second batch of senior presentations started off with Bridget, who reported on the Bridges of Hartford and how they affect heavy metal concentrations in the Park River watershed. Bridget was supposed to present last week, but was too busy beating The College of New Jersey in Lacrosse (15-8). 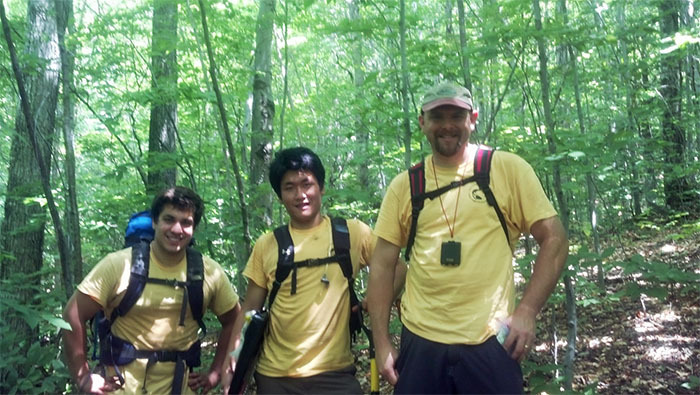 Greg was next, updating us on invasive species work at Knox Preserve in Southington, CT. He investigated the effects of various treatments (mowing, spraying with herbicides) on plant populations, ecosystem diversity and invasive species abundances. His research is part of a longer research effort by Prof. Douglass on invasive species management. 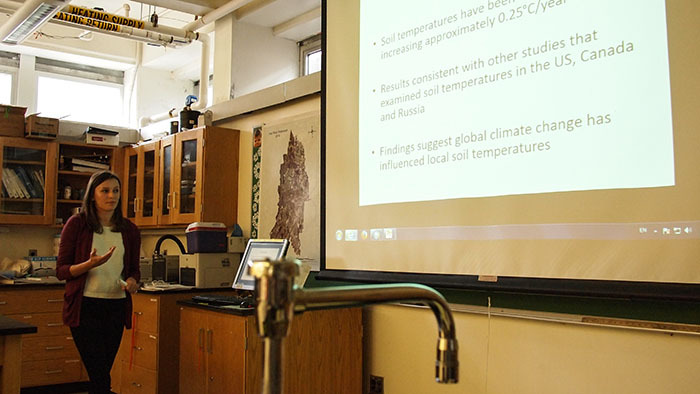 Lia told us about her analysis of soil temperature data that had been collected since 2007. She had some bad news for us: soil temperatures had increased by an average of 0.25C per year, and two of the thermocouples need replacing. Jon and I will get right on it once the semester is over. On we moved to the White Mountains: Justin presented baseline data for aluminum and calcium concentrations in forest soils prior to clear cutting. Dan analyzed the same sites for mercury and organic matter concentrations. Their work is the beginning of a long-term study on the effects of clear cutting on forest soils in the White Mountains of New Hampshire. Justin explaining some finer points of his statistical analyses. Brooke finished the afternoon on a high-note presenting her mineral analyses of lake sediments from Otsego Lake, NY. Brooke used X-Ray Diffraction to quantify the abundance of terrigenous materials in lake sedimenst and reconstruct storm events. Her analyses confirmed the influence of eralier storms and revealed a period of low lake levels between 2000 – 6000 years B.P. Last Wednesdays ENVS students and faculty were treated to a series of senior presentations about our student’s integrating experience. Maria kicked it off with a talk on altruism and organic markets, finding consumers of large-scale organic markets (think Whole Foods etc.) act mostly for selfish reasons (healthier, better for me), while shoppers in a local neighborhood co-op in Spain cited mostly social and community reasons for shopping at the co-op. 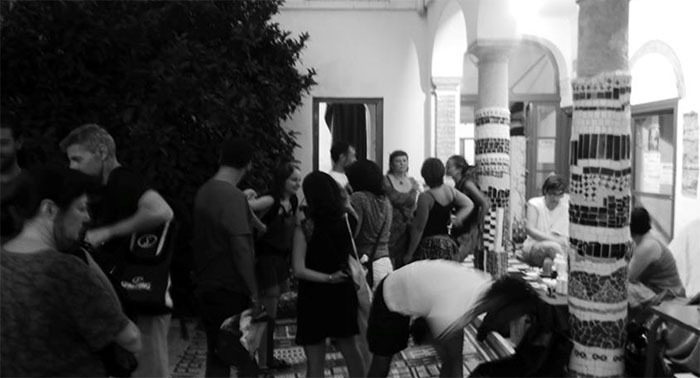 Rose and Kate presented their work performed while abroad with the School for Field Studies. 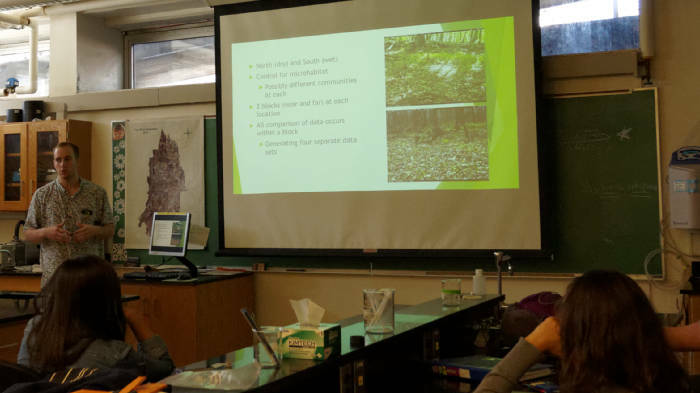 Rose studied water management in the Ambroseli region of Kenya, while Kate told us about skinks from Whakatiwai regional park in new Zealand. Shaina and Jenna both introduced us to their mapping projects. Shaina presented interactive maps of schools within the Park River watershed, while Jenna showed off her GIS wizardry skills estimating plant biomass based Normalized Difference Vegetation Index (NDVI). 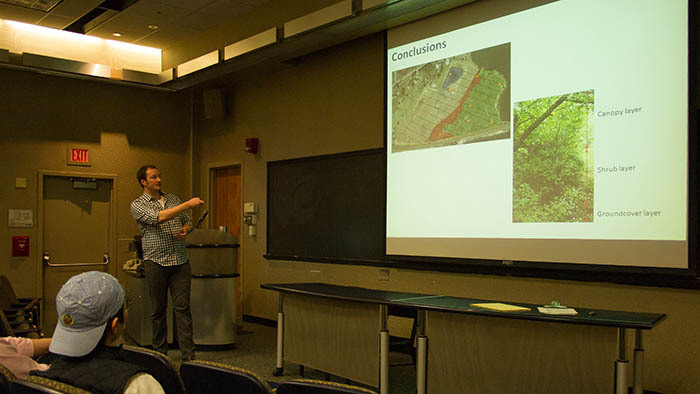 Alessandro and Tori presented research on magnetic properties of lake sediments and data from our weather station respectively, while Ben brought us up to date on current animal studies on and around the stone walls (and compost piles) on professor Smedley’s property. Our senior presentations will continue this Wednesday with five seniors presenting the results of their honors theses. Presentations will be held on 4/22 in McCook 115 from 1:30 until the bitter end. Cameron Douglass and Alex Perez (’17) led a community roundtable discussion Monday evening at Hartford City Hall, during which Alex presented GIS analyses and community survey results he’s been working on for several semesters. For more information head on over to the Trinitycology blog. These days we are surrounded by news of global environmental issues, from climate change to concerns about pollution and tropical storms. More and more students around the world are becoming involved in these issues because we see the impacts. Trinity students are no different, and we are tackling these global issues on the smaller scale of our campus. 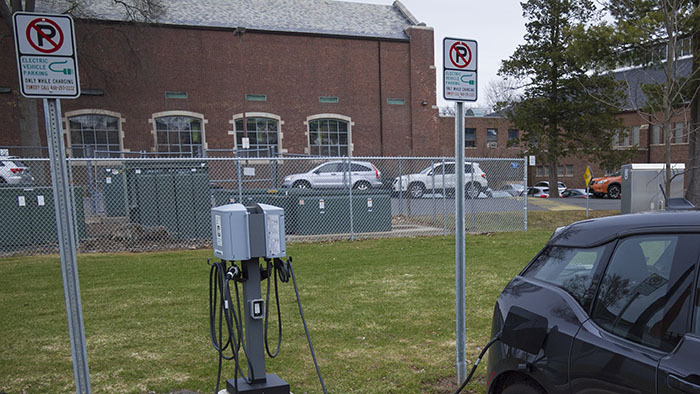 Trinity College supports a spectrum of activities and organizations for students interested in sustainability. Student-run organizations like Green Campus are cornerstones for sustainable practices across campus, including recycling and composting through numerous activities. One of the largest projects this organization is taking on is composting in the largest dining hall on campus, Mather. This group of very enthusiastic students has an ultimate goal to show that sustainability and conservation activities are fun, and as beneficial for Trinity’s environment and students. 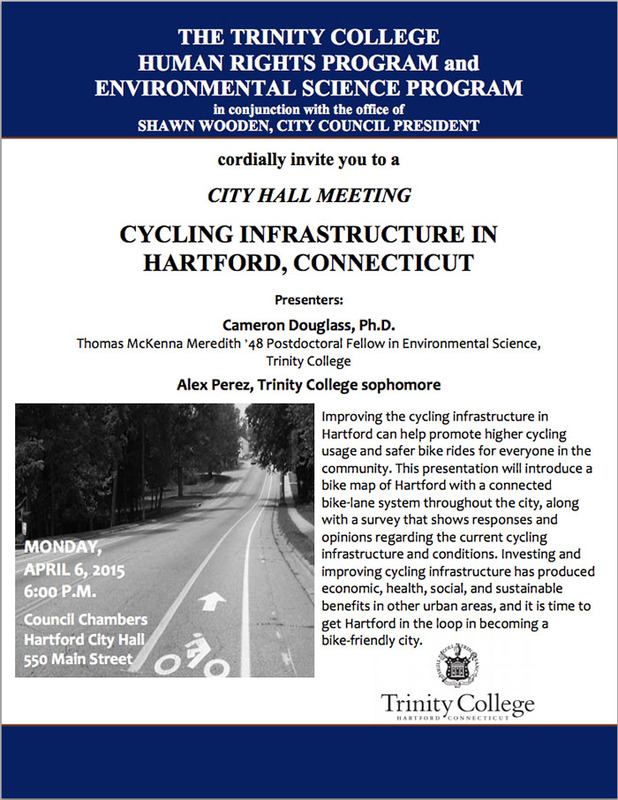 Students from Green Campus and from the first-year seminar on Cycling, Sustainability, and Hartford – led by enthusiastic professors – are forming a campus-wide Sustainability Committee this semester. Everyone interested in sustainable activities is welcomed to join, regardless of major or position. Let’s spread Green Trin spirit! 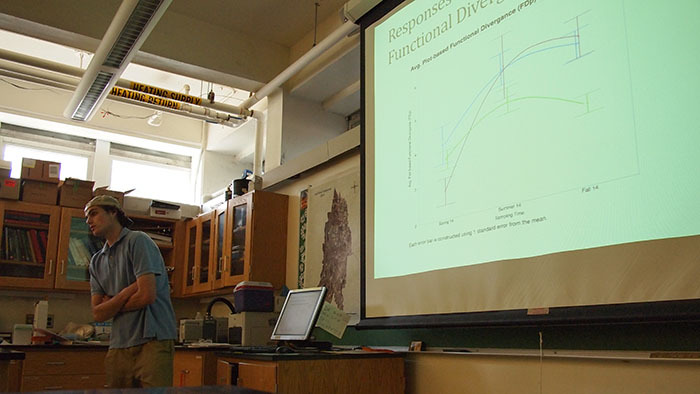 Cameron Douglass, our current Thomas McKenna Meredith’48 Postdoctoral Fellow in Environmental Science (still the longest title in the program :-) gave his annual lecture on Friday afternoon. 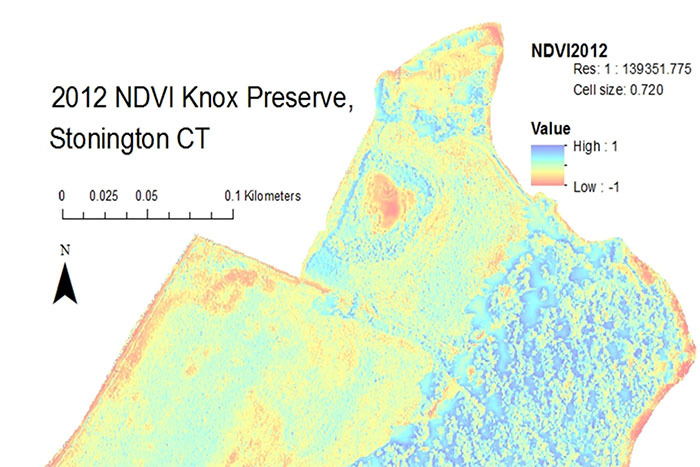 Over the past two years Cameron and his students have performed research at Knox Preserve near Stonington, CT, analyzing the effects of various land management practices on invasive and native species. Cameron began by embarrassing all his research students, proudly presenting them to his audience. 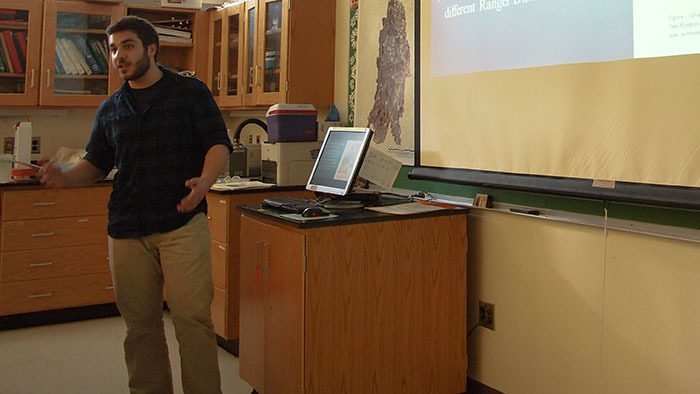 He then moved on to describing the difficulties one faces when managing invasive species, and presented the effects of various eradication techniques on native and non-native species. From his talk it became clear that invasive species management is a prolonged process: initial treatment requires a commitment to regular follow-ups. His work also shows that one approach hardly fits all and management techniques have to be tailored to the problems at hand. 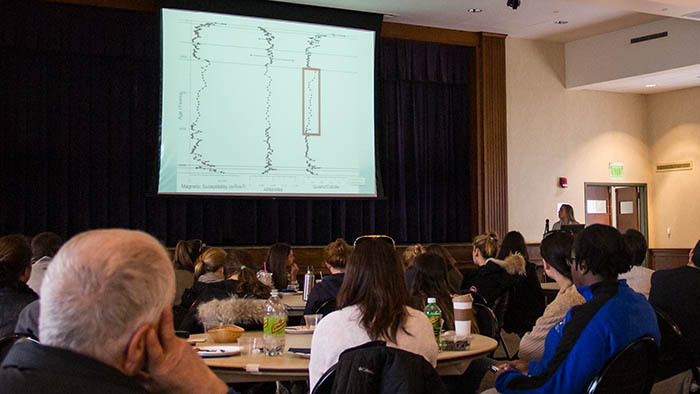 This Thursday Brooke Moore presented the results from her honors research at the 2015 Joint Science Presentations. Brooke used X-ray diffraction (XRD) to quantify the relative abundance of quartz and calcite minerals in a sediment core from Otsego Lake, NY. 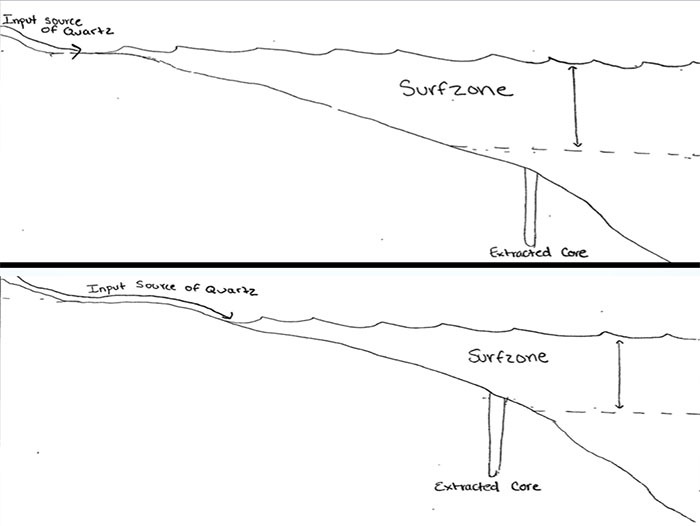 The watershed of Otsego lake consists mostly of highly magnetic shale, and increased erosion should lead to increased quartz concentrations in the watershed. Brooke’s thesis attempts to identify periods of higher than normal erosion and link erosion patterns to changes in climate through the Holocene. For more details on Brooke’s thesis you will have to come to her senior thesis presentation on April 22nd.